The Genée International Ballet Competition 2016 in Sydney. Gold Medal Winner Maeve Nolan. Photo by Winkipop Media, courtesy of Royal Academy of Dance. This week, dancers are hard at work in the studio, taking class, receiving private coaching on their solos in preparation for competition and learning work from a leading choreographer, all as part of the 2017 Genée International Ballet Competition, held for the first time in Lisbon, Portugal. The 2016 Genée in Sydney. Photo courtesy of RAD. The 86-year-old competition is part of the Royal Academy of Dance’s (RAD) commitment to widening access globally to the highest standard of dance training. Last year, the Genée was held in Sydney. The Genée is open to dancers aged between 15 and 19, who have passed the RAD Intermediate, Advanced 1 and Advanced 2 examinations in Classical Ballet. During the 2017 week-long event, students receive intensive coaching by world-renowned répétiteurs and choreographers in the studios of Companhia Nacional de Bailado. Each year, the RAD Artistic Director also commissions a choreographer who creates a new piece with participants. This year, César Augusto Moniz is creating two variations to be premiered at the competition final. For the competition portion of the Genée, the Semi-Finals will be held 13 – 14 September, at Teatro Tivoli BBVA, and the Final will take place at Teatro Camões on 16 September. The judging panel will consist of prominent figures in ballet, including Director of The Royal Ballet Dame Monica Mason, Artistic Director of Scottish Ballet Christopher Hampson and former Artistic Director of the RAD Lynn Wallis OBE. Many Australian dancers who have previously competed at the Genée have worked as professional dancers in some of the world’s top ballet companies. Laurel Gill, the 1935 Gold Medal winner, for instance, was the first Australian female to join Sadler’s Wells Royal Ballet. 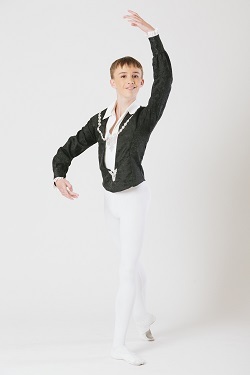 And more recently, 2014 finalists Jessica Allison-Walker and Vida Polakov are dancing with West Australian Ballet; and Joshua Price, last year’s Gold Medal winner and recipient of the Margot Fonteyn Audience Choice Award, is now at San Francisco Ballet School, on his way to a professional career. There are many Australian dance students competing at this year’s Genée as well, such as Brisbane’s Lucy Christodoulou and Matthew Maxwell, whom you can get to know more about and their experience at the Genée below! Is this your first time competing in the Genée? What have you most been looking forward to about participating in the Genée? Why do you think the Genée is a great opportunity for dancers? A unique part of the Genée is the coaching dancers receive, which is probably invaluable! What has been your experience been like so far? What do you like about Lisbon? Have you seen any incredible sights yet? What are your dance goals? Any dream companies or choreographers you’d like to dance for? What do you hope to take away from this year’s Genée? Jacqueline Morland Awards Queensland 2017 Winner Matthew Maxwell. Photo courtesy of RAD. For more information on the Genée International Ballet Competition, visit www.rad.org.uk/achieve/the-genee/genee-home-page. Who will win Sydney Eisteddfod’s 2017 Dance of Champions?